Step 1: Cut shapes from cardboard or get MDF cutouts from local market. Step 2: Make patterns with thick cord and stick with Fabrica Glue. Step 3: Allow to dry completely. 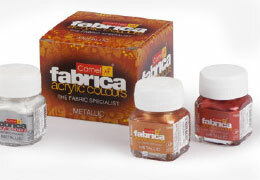 Step 4: Mix Fabrica Gold Powder with Camel Medium 2 and paint all the pieces. 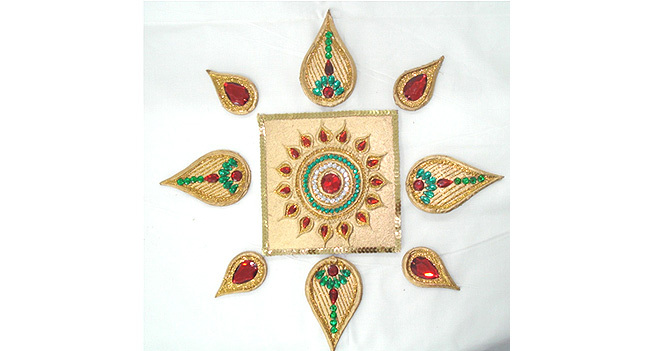 Step 5: After drying, stick Kundans, decorate with glitter and stick zari or sequin lace.